On 13 April 2016, following the Extraordinary General Meeting held by Magnis Resources Limited (ASX Code: MNS) held on 5 April 2016 it was announced that the resolution vote to approve the demerger of the uranium assets and the pro rata distribution of shares in Uranium Africa Limited (UAL) was unanimously approved by shareholders. The allotment of the Uranium Africa Limited fully paid ordinary unlisted shares was completed by Link Market Services. In summary, every 1 Magnis Resources Limited share held at the Record Date of 8 April 2016, 0.52828 shares in Uranium Africa Limited were allocated as the in-specie distribution. “That, subject to all other Resolutions in this Notice being passed, for the purposes of section 157(1)(a) and for all other purposes, approval is given for the name of the Company to be changed to Optimal Mining Ltd. The Company is an Australian based company focused on the exploration and development of high-quality uranium assets based in Australia and Tanzania. The Company is in the process of preparing the necessary documentation for its Initial Public Offering which is scheduled for finalization within the next two months’ subject to market conditions and successfully meeting all of the regulatory requirements. The Company will be seeking a listing on the Australian Securities Exchange, under the current Listing Rules the company requires its shares to be priced at a minimum of 20 cents per share. 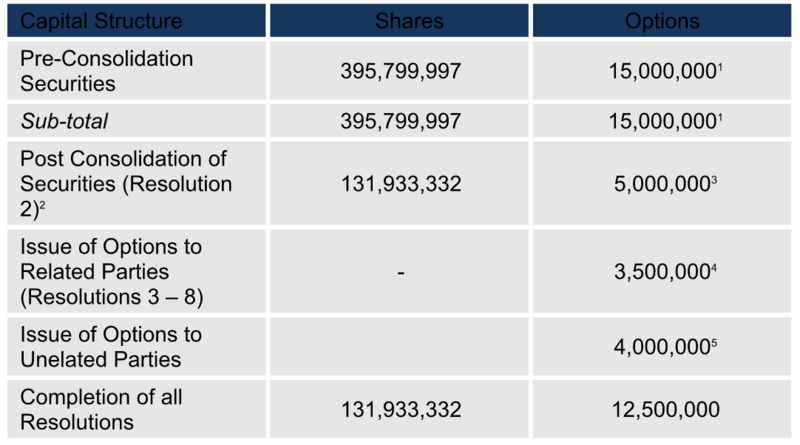 The most recent capital raising was conducted at 6 cents per share, hence the need for a 1:3 share consolidation. The effect which the consolidation will have on the Company’s capital structure is set out in the table below.